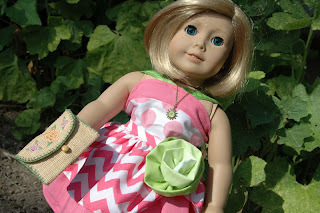 30-Minute Doll Clothes blog tour. Instead of the bow on the side of the skirt I made a rose out of a 2 1/2" strip of the ombre solid. I cut the strip 2 1/2" x 22". Press wrong sides together along the long edge of the strip. Round the corners by trimming off the square edge. This will take away the excess bulk on the corners. Using a double threaded needle, do a running stitch about 1/4" from the raw edges. Sew some stitches back and forth across the back to keep the rose in the desired shape. You can either pin or stitch the rose in place. I love the ombre effect of the color going from light to dark on the rose. At the side of the skirt I took the top layer and did a running stitch to gather the side. Then I stitched the rose in place. The Birthday Party Trio was so quick and simple. You will love how easy and quick each of the doll dresses are in this wonderful 30 minute doll clothes book by Nancy Zeiman with Joan Hinds. Below is some important information you will want to check out. All blog tour hosts will use the patterns from the 30-Minute Doll Clothes book and add their own personal flair. On every tour date below, be sure to visit each of the blog postings to see creative doll fashion creations. Fun Prizes will be awarded to random readers at the close of the blog tour. To be eligible for the following prizes, post a comment at the bottom of Nancy’s July 10 blog tour posting. Share with us your memories of making doll clothes or what types of doll clothes patterns you'd like to see in the future. Winners will be posted on Tuesday, July 24th. 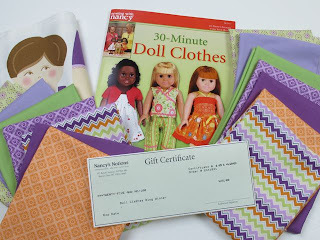 Nancy Zieman's Doll Clothes Blog Tour Prizes. Beautiful! 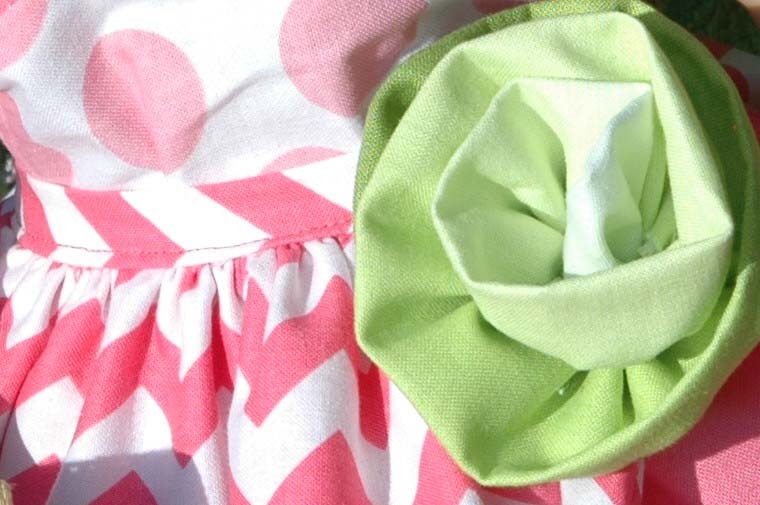 I love your fabric choices and the rose in the ombre fabric is fabulous! Gorgeous!!! Love the colors you used. I made a few 18 in doll clothes when my daughter was young. It was great fun. Beautiful JIna. Love the use of the pink chevron as well. Such a gorgeous doll dress. And thanks for the tutorial on the rosette. It's darling. Will have to try my hand at a few. Your outfit came out so beautifully, love the colors you used. 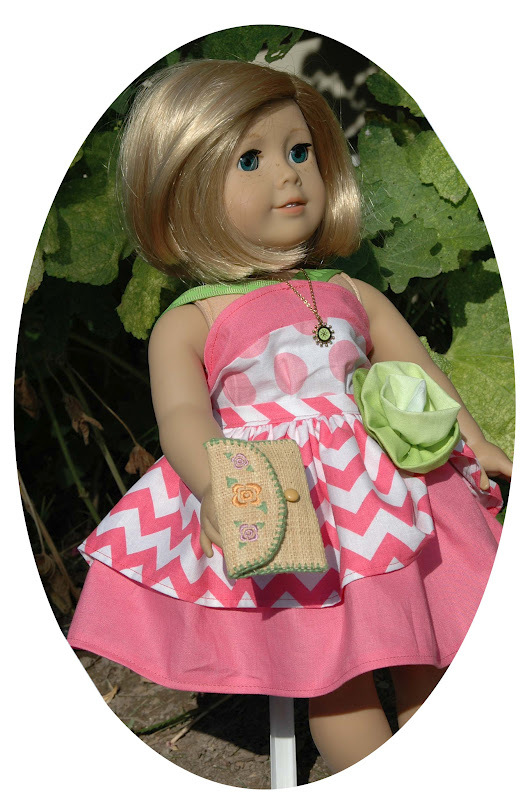 I have made dolls and clothing, usually simple and prim styles. I love vintage style clothing for dolls, would love to see more of those. Super cute! My Daughter just received her first doll...this stage of play and memory making has just begun for our family. With two girls I'm excited to make more clothes and more memories! This is a terrific blog tour, and this new book & video look like great fun to own & use. Quicker to get to the finish line. Thanks for sharing! 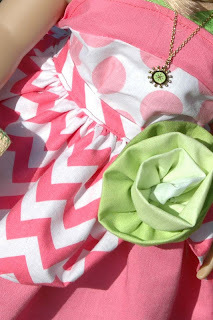 I will have to find this book and make my grand daughters some of these pretty doll cloths. Adorable outfit! I love seeing all the personal touches. I really am going to have to get this book! I like the rose decoration you made, and the little purse you added. It makes the outfit complete. HELLO! HOW CUTE! LOVE THE ROSE TOO! THANKS FOR SHARING YOUR IDEAS+GIVEAWAY! I love the rose you added to the doll dress. It's amazing what a big difference a small detail can make. The ombre rose is awesome! Great giveaway too. My first response didn't show up so I'm trying again. I remember making doll clothes when I was young but they were mostly tied together because I didn't know how to sew! I have made many American Girl outfits over the years -- a plaid cape for Samantha, with matching spats and furry hat and muff, for example -- but this new book sounds absolutely fabulous! Now I want to make some doll clothes from it for my granddaughters' dolls! Your outfit is just too cute. Thank you for the idea of the rosette. This is darling. I have always loved to sew doll clothes - first for myself and now for the grandchildren. I would love to see patterns for uniforms - school or sports. as a child my aunt taught me to crochet and I made doll clothes that way.